KoopaTV: Apple Arcade: New Subscription Service...?! By LUDWIG VON KOOPA - Curation. But it's not a big deal, really. This article is about Apple, fair warning. Never wanting to be outdone by their immortal enemy and fellow big app store provider, Google (see last week's announcement about Google Stadia), Apple had a keynote address where they announced a bunch of initiatives we shouldn't care about, plus one gaming one called Apple Arcade. No, it's not like the Arcade Archive series where it's a bunch of old arcade games ported to a modern system. It's new games curated to a platform that spans your iPhones, your iPads, your Apple TV, and your Mac. ...Gaming on a Mac? Yeah, I guess. 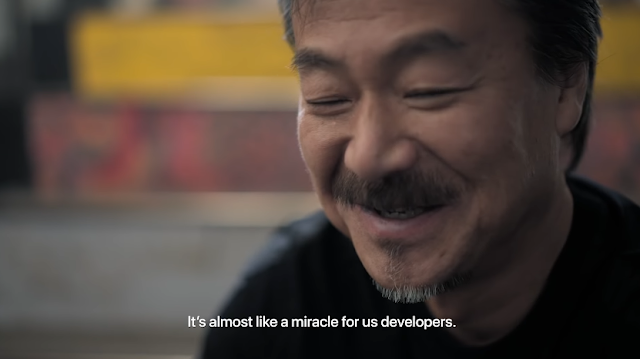 Here's their trailer, which, uh, portrays this as a big deal (“everything is changing”), but not the “future of gaming” that Google was blabbering about last week. Interestingly, they'll be releasing around the same time: later in 2019. While the Apple App Store already exists, and I really dislike its policies and the people who use it, Apple Arcade is like a super-special version of the App Store. Instead of free-to-play ad-ridden micro-transaction nonsense, you pay a subscription fee (exact pricing unknown) and get access to however many games there are (>100) with no advertisements or in-app purchases. How developers get paid is unknown (100-way split?) but Apple is going to help fund development. And no data tracking. You actually have privacy. (Unless you consent to not having privacy.) I guarantee that's a huge differentiator compared to Google's service, as well as other Apple products. I actually like that privacy is now something you pay for. See how much it's valued. Unlike a streaming service and Super Mario Run, you can play the games while not connected to the Internet. Major positive. Let's look at the games. According to varying reports, the games on Apple Arcade are supposed to be exclusive. Meanwhile, today we learned that Shantae 5 is announced by WayForward, and releasing on all major consoles, PC, and the Apple Arcade. I'm not really sure what's exclusive about that, so media reporting needs to clarify that. Perhaps by exclusive, they mean within the Apple ecosystem. It might be on Apple Arcade, but it won't be in the normal non-subscription part of the Apple App Store. That seems significantly less appealing for anyone with any other gaming options, which if you're interested in gaming, should be everyone. Why would any self-proclaimed gamer have Apple products as their only option? ...Hah, gaming on a Mac. There's not even a controller to show a screenshot of. I don't think there'll be a controller for this later, either. In short, Apple Arcade is going to be a new tab in the App Store that Apple ecosystem members can subscribe to for premium (by Apple standards) experiences that Apple is helping fund, playable across all the hardware devices on the Apple ecosystem. Unlike games currently in the App Store, Apple Arcade games won't be lost among hundreds of thousands of competing applications. This doesn't seem to have the amount of capital investment that Google is putting into their new platform. I wonder if Nintendo will put their upcoming mobile games on Apple Arcade... or if they won't have the problem of discoverability (it's Nintendo, after all) caused by going on the normal App Store. If they go on the normal App Store, they'll be able to charge exploitative gacha cash like they do in Fire Emblem Heroes. Guess we'll find out what happens. Ludwig would rather subscribe to something like this than a cloud-based streaming service, but neither compare to physical games on a console. The takeaway from today's and last week's articles is that everyone is making “bring your games with you from device-to-device”, the Switch's value proposition, their own value proposition. He wonders if he'll cover any more non-traditional console manufacturer gaming endeavours next week. Seems to be a trend.